Columbia Glacier was our first destination. This year we got to enjoy to the 1.5 mile warmup from the washout of NFS Road 63. Looked like a little can do attitude could have made the road ready, for at least this summers use, in a few hours of work. The approach via the Beckler River Road 65 and Jacks Pass proved almost as fast as the North Fork Skykomish. Quin Ourada from Oregon State, Tom Hammond, UW and Ben Pelto joined me. Leaving the trailhead at 5:30 I did not expect to reach our camp 3000 feet up and 4.5 miles later until near dark. I had not backpacked all summer, as I had broken my foot in late May. Columbia Glacier: The berries and wildflowers were clearly behind recent years on the hike up, but snowbanks were about normal. This suggested a late start to summer conditions, but a warm early summer period. We made it to camp before 8:30 and have to admit the east coasters, Ben and I were in bed by 9:00 despite the clear starry skies. After crossing the logjam at the outlet of Blanca Lake and circling the lake we arrived to find a considerable change in the region around camp. Flooding had covered the heather region of camp under considerable rock and sand, and the river bed had sharply eroded its bed near camp. 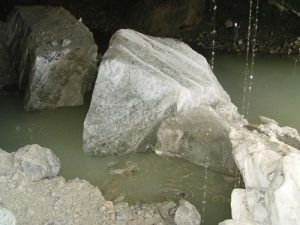 The first sign, that the November flood was felt strongly in the alpine region. The snowpack on the Columbia Glacier was the best since 2002, but still not deep enough to offset the amount of melting that has and will occur. The lake at the end of the glacier has grown, and even goes under the glacier in a spectacular but dimly lit and water floored cave. We proceeded to probe snowdepth in more than 200 locations on the glacier and map its surface elevation along a center profile. The result the glacier will close to a meter of thickness overall this year. Gorgeous blue skies continued right up to our hike out from Blanca Lake. 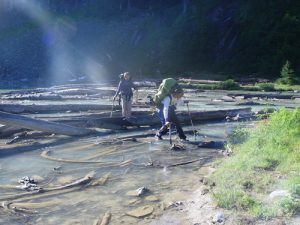 Easton Glacier: After fortifying at Index Café, and swimming at Baker Lake, warm water this year, we headed north to Mount Baker’s Easton Glacier. The hike in that evening, is an easy route, but after our 7 mile warm up hiking out, up then down from Blanca Lake, it did not feel easy. We arrived at the terminus of the glacier camp shortly before dark, for Lipton Garlic Shells. That night the clouds snuck up on us, and by morning a light pitter, patter was evident. A wet morning on the lower part of the glacier probing snowpack, had us back for a siesta in our tents, until the rain eased in the late afternoon. Oh, the worst part was collecting every insect we could find in 10 square meter area of the glacier in the rain. Tom was delivering these bug collections to a UW professor. Surprising how many there are even if you wish there were none. Back on the glacier we finished our glacier terminus survey and found 20 meters of retreat since 2006, and 65 meters since 2004. Clouds descended around us for our Lipton Teriyaki noodle dinner. The next morning clouds again dominated, until we climbed out of them ascending the glacier at 6500 feet. Snowpack was about normal from the terminus at 5400 feet up to 6500 feet. We found the number of crevasses reduced even more from the peak in 2005 in the lower mile of the glacier. The impressive massive serac zone that dominated the east side of the glacier 500 meters above the terminus from 1990-2003 has become a steep but relatively placid crevassed blue ice zone. Above 7000 feet the average snow depth quickly rose from 2.5 m to 4.0 m, by 8200 feet the average snow depth had leveled off at 6 meters. We enjoyed the sun, well the clouds lapped against the mountain flanks below us. 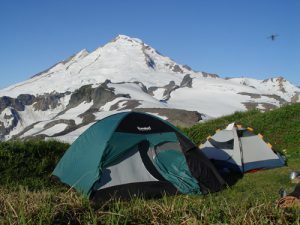 The next morning we hiked out from the glacier and circumnavigated to Artists Point on the north side of Mount Baker. We met Maria Coryell Martin, an artist who would be with us for the rest of our research. From Seattle Maria is pursuing a “Portraits of Ice, Witnessing Climate Change through Art,” this project is formally recognized by the International Polar Year. The parking lot was jammed, but by the time we we passed Table Mountain, we were nearly alone. The afternoon hike out Ptarmigan Ridge was even chilly, as clouds dominated again. We arrived at Camp Kiser in the evening, and Ben spied a herd of 12 goats east of us, we were the only campers. Lipton Thai Sesame noodles never tasted so good. The next morning we headed to the Sholes Glacier. Half way across the glacier we noticed a small group of mountain goats, a moment later we rounded a ridge on the glacier and could see that these were merely the scouts for the largest group of goats I ever saw. These herds are not tame at all and do not allow for close approach. We squatted down on the glacier and observed them, coming to the consensus of 52 goats. Take a look and come up with a count for yourself. There are two outliers from the group. We spooked the goats over to the Mazama Glacier Sholes Glacier had thin snowpack, less than 2 m across its lower two-thirds. And more than 3 m in the upper third. The view from the Upper Sholes Glacier showed steam from the Dorr Steamfield. Upon our return we noted an additional herd of 28 goats on the north side of Coleman Pinnacle. The two groups ensured at least 80 different goats had been seen, the 12 from the night before may have been part of the 28 goats. This is the highest population for the area since we began our goat notes in 1984. The clouds moved in that evening, and by morning, it was blowing drizzle. We headed for Rainbow Glacier through the whiteout, who knows how many goats we passed. It was too chilly to stop for long during the 9 hours we spent on the glacier. Our only respite from rain and wind was our ice cave we found for lunch. Rainbow Glacier had a normal snowline for early August at 4900 feet. The snow depth remained normal to 5600 feet. Above this point snow depth quickly increased from 3 to 6 m, leaving the crevasses on the upper glacier the easiest to navigate for sometime. We wandered through whiteout from crevasses to crevasse measuring snow depth all afternoon. We arrived wet but warm in camp. After warming and putting on dry clothes and reading in our tent we had to emerge for dinner. Not wanting to get new clothes we wet, we put on wet clothes for our Lipton Alfredo Broccoli dinner. Dancing around the stove well it all cooked, we found the chill did not leave, but on reentering the tents, we warmed up more than before we had gone out. Morning brought no change more drizzle and whiteout as we packed our heavier packs due to water absorbing powers and hiked out. Probing snowpack on upper Lynch Glacier. Daniels Glacier below. Lower Curtis Glacier: A quick trip to the nearest laundromat in Maple Falls and we were back at the Austin Pass trailhead for a chilly cloudy hike into Lake Ann. We arrived in cloud. After Lipton Thai Sesame noodles, magically the clouds lifted for 30 minutes before sunset, not that we saw the sun. Whiteout prevailed in the morning, making for a peaceful hike to the glacier. The outlet stream draining the glacier had been on the west or right side of the glacier as you face it, for 20 years. This year the stream had shifted and was now coming out the east side of the glacier, heading down a separate valley below the glacier. This made it easy to traverse below the seracs of the very impressive terminus. This is the thickest most vigorous glacier terminus in the North Cascades. The terminus is thick enough that retreat has slowed down, after rapid retreat in the last decade, though the west side of the glacier continues to retreat laterally. Snowpack on the glacier was consistent in the 2-3 m range, not good, not bad for the start of August. While we probed the glacier Maria completed some excellent water color studies of the glacier terminus. Returning to camp the whiteout prevailed right through the next morning, yet nary a drop of rain. Mount Daniels: An early morning hike out saw on the road south by 8:30 headed for Mount Danniels. A swim in the Cle Elum River at the turn to Cooper Lake under a blue sky was just what we needed after six of seven days in the clouds. The November flood had significantly changed the stream channel around this wonderful pool. Instead of a gentle continuous rapid above the main pool, there was now a single steep nearly waterfall rapid with placid flow above it. The pools had been deepened and filled in various places, and large trees littered the banks. The road repairs from the washouts reflected a can do attitude in this area. The hike to Peggy’s Pond was not the normal sweat ritual. The bugs also seemed to cold to bother with us. Hyas Creek just passed Peggy’s Pond had altered its channel and downcuts in channel severely in many places, after looking nearly the same for 20 years. The berries on every hike had been late, yet once again the snowpack in the lower alpine areas was normal. The Ice Worm Glacier had only two tiny bare blue ice spots, but snowpack was uniformly thin, less than 2 m. We emplaced stakes to check in several weeks. By that time the glacier will be mostly blue ice. The glacier has shrunk to less than half of its 1984 area and at the recent rate of thinning has 10-20 years left. We explored the iceberg lake that used to be in contact with the glacier, but which now is perched above the north side of the glacier. We crossed the icebergs on the lake just for fun, probing our way until we were 15 feet from the far shore with a small berg in the middle of this gap. Ben and Quin went for the iceberg long jump, partly due to blue sky delirium I am sure. Quin almost made it, fortunately it was a barefoot attempt with pack and boots safely on shore. The key lesson do not overstride on takeoff. The next morning windy whiteout had returned. We circled the mountains east ridge to Daniels Glacier. The glacier had good snowcover, which was deeper than it has been since 2002. The normal crevasse problems were all filled in, with most of the glacier under 2.5-3.5 m of snow still. The steep zig zagging traverse up this glacier, required wearing all the clothes we could in the biting wind. This glacier has lost 35% of its area since 1984 including the entire section descending from 6800 feet to 6400 feet. We crossed onto the glacier in a gale of a wind, but still dry cloud. A brief view down and across glacier was all we got before the cloud settled around us again. Snowpack on the Lynch Glacier like the Daniels Glacier was high above 7000 feet. As we descended to the terminus at Pea Soup lake the snowpack was reduced to normal. Crevassing had never been so limited, as the crevasses were still filled and there are less as the glacier has slowed. Conditions were so foggy we could not accurately assess the terminus retreat since last year, but that was because retreat had been minor. Snowpack on the ever disappearing Foss Glacier was not quite as good, partly due to all the new exposed rock in the midst of the dying glacier. We ascended 1700 feet from Pea Soup Lake to the summit of Mount Daniels directly up the center of the Lynch Glacier. Probing every 100 feet providing the necessary breaks. We emerged from the clouds right at the top of the glacier. Summit views were limited but at least existed. We arrived back at camp for our last Lipton meal a smorgasborg of Alfredo dishes. The next morning checking the melting that had occurred during the last several days on Ice Worm Glacier we found it had amounted to 1.6 inches per day. Typical is 3.5 inches on a mid-August day. Overall North Cascade glaciers had a better year than any since 2002. The glaciers overall did lose mass. Only Rainbow Glacier will likely finish the summer with a positive balance. There was a clear trend of typical snowpack at lower elevations, with an abrupt increase at 7000 feet on Mount Daniels and Easton Glacier, 5600 feet on Rainbow and 6000 feet on Sholes Glacier. Lower Curtis, Columbia and Ice Worm Glacier all lie below these elevations and did the poorest by far. Due to the poor visibility I failed to get pictures of the Yawning and Cache Col Glaciers that can be seen from Sahale Arm. So if anyone has or will have a chance to photographs these glaciers in August or September I would appreciate seeing the results.